Take a virtual tour of our detailed interactive map, which showcases all of the awesome activities at Sugarloaf! Enjoy a stunning waterfall which flows 25 ft. high after winter rains! 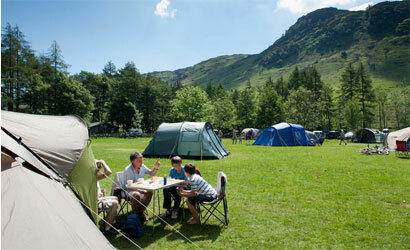 We offer 47 family-sized campsites! Group camping available as well. Bioblitzes are gatherings of scientists, citizen scientists, land managers, and more, all working together to find and identify as many different species as possible. Bioblitzes not only help land managers build a species list and atlas for their park and provide invaluable data for researchers, they also highlight the incredible biodiversity in our area. Our bioblitz is open to anyone and is family-friendly. Just bring your smartphone with the iNaturalist app, your curiosity, and your powers of observation to help catalog the natural wonders of our parks and open spaces. Registration is free, but be sure to let us know you’re coming! Read more about bioblitzes here! 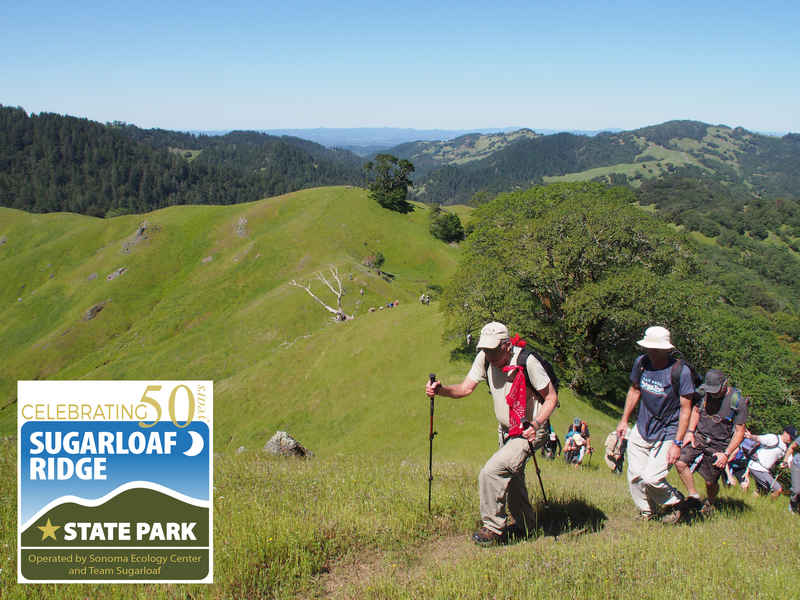 Celebrate 50 years of Sugarloaf on this special hike from Hood Mountain Regional Park to Sugarloaf Ridge State Park via the historic McCormick Ranch section of Sugarloaf. 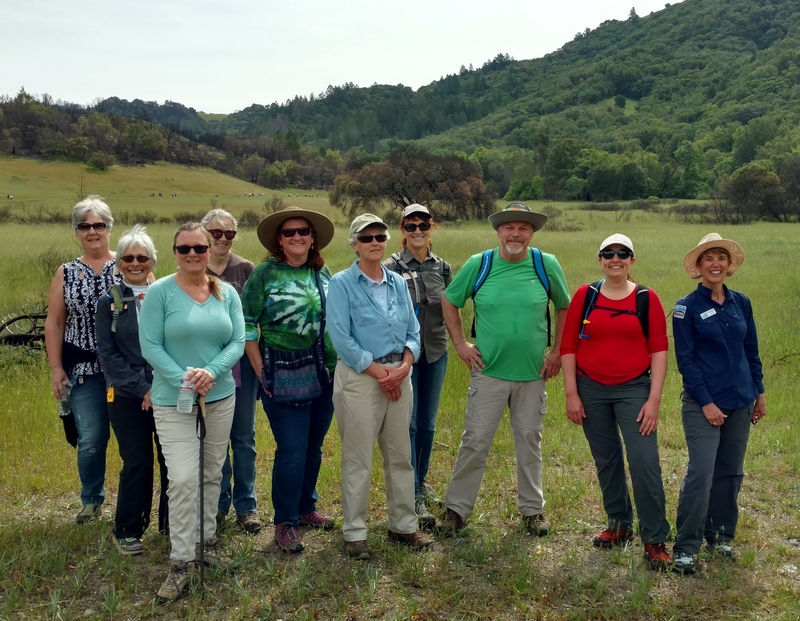 Bill and Dave Hikes leads this grand tour of the Mayacamas Mountains in the northern half of Sonoma Valley and will pass close to the headwaters of Santa Rosa and Sonoma Creeks. The Perry family has generously given permission to hike through their property, allowing our adventure to go the back way along the Napa/Sonoma county line. 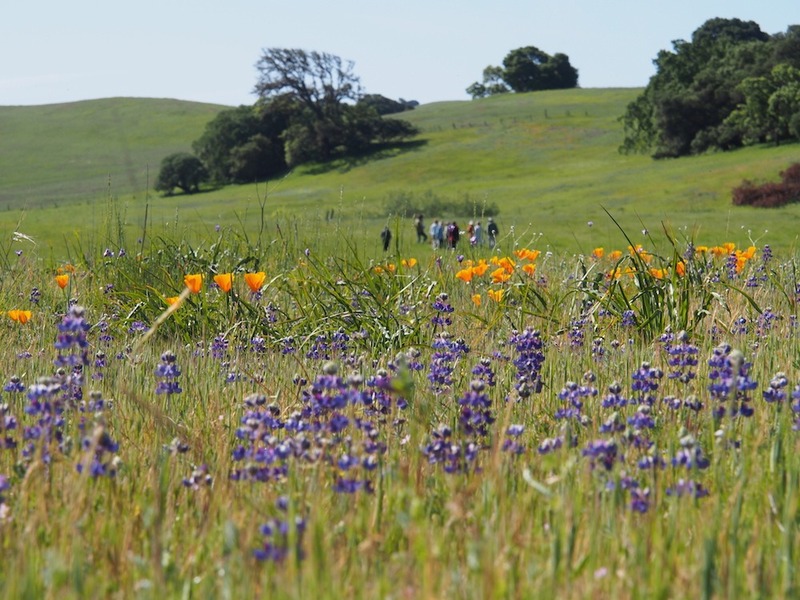 The route will take participants through some of the wildest and most beautiful sections of Sonoma County filled with massive trees and lovely wildflowers. The terrain also has some amazing history especially of the McCormick and Hurd families. At the end of the 11-mile hike, join your fellow adventurers for a delicious barbecue meal at the Sugarloaf day use picnic area, beer and wine included. Participants should arrive at Sugarloaf Ridge State Park no later than 8:45am, and shuttle buses will leave at 9 AM to the Los Alamos parking lot of Hood Mountain Regional Park. From there, hikers will follow the Hood Mountain Trail down to Homestead Meadow and then cross into the McCormick addition of Sugarloaf. We will work our way up Quercus Trail, Grandmother Oak Trail, overlook the former Spaulding property, and have a brief stop at Red Hill. Continuing up Maple Glen Trail, our group with permission from Jim Perry, will hike southeast along the county line and enjoy lunch at the top of “hill 2530” (named for its elevation). We will enter Sugarloaf and take a break at the Red Barn where snacks and cold drinks will be provided by Team Sugarloaf. The group will then proceed up to Bald Mountain and finally work its way back down to the day use area at Sugarloaf for a barbecue dinner. The route covers approximately 11 miles with elevation gain of about 2800 ft. We expect to arrive at the barbecue about 4:30 PM. Tickets include transportation, snacks, drinks and BBQ. Please bring a lunch, water and be prepared to walk 11 miles over the steep and sometimes rough terrain, stream crossing of minimal depth. Please dress appropriately for the weather. Tickets here! For more info about Bill & Dave Hikes, check their website. Join Botanist, Peter Warner, in this Sugarloaf exploration! Enjoy Sugarloaf’s wildflowers, plant ecology and fire-follower exploration with botanist, Peter Warner. On this leisurely walk with elevation gains and losses, we’ll observe spring growth and look for effects of fire recovery across several different habitat types, including grassland, oak woodland, and chaparral. What better way to Celebrate 50 years at Sugarloaf?! Wear clothing and sturdy footwear you don’t mind getting dirty, and expect 3 to 4 miles at a slow (botanist) pace. Bring water and snacks and dress for both sun and rain! Tickets: $10. https://www.brownpapertickets.com/event/4057263 Parking fees apply. Want to do a through hike from Sugarloaf Park to Hood Mt. Los Alamos Parking Lot or vice versa? Catch a ride on the Sugar-Hood Shuttle! On this hike you will cross two of the Sonoma County’s most important creeks; Sonoma and Santa Rosa. About a mile from the Los Alamos parking lot, you will cross Santa Rosa Creek, just downstream for the joining of the North Fork and the South Fork. From the Sugarloaf lot, you will cross Sonoma Creek and Bear Creek, two critical steelhead habitats. Every hour our Shuttle will leave from either Sugarloaf Park or Hood Mt. Regional Park Los Alamos Lot. Make a reservation and then ride to the other end of the trail, or hike and ride back. Riding first and hiking back to your car is the easiest way – no worries about how long you take to finish your hike. First Pick-up is at 9:00 am at Sugarloaf and runs through 12:00 pm last pick up at Hood Mt. Los Alamos Lot, at the end of Los Alamos Road. (NOT the Pythian lot on Pythian Road). This 7.5-mile one-way hike with 2,200 feet of vertical climbing takes 4 to 5 hours. We recommend dropping your car off at one end and riding the shuttle to the other, so you do not have to wait for the shuttle to return when you finish your strenuous hike. No charge for the ride, but the suggested donation of $10 helps keep us going. Dogs are not allowed on the shuttle or the State Park portion of the trail. Shuttle operated by Team Sugarloaf / Sonoma Ecology Center in partnership with Sonoma County Regional Parks with funding from Regional Parks Foundation Funky Fridays Events. 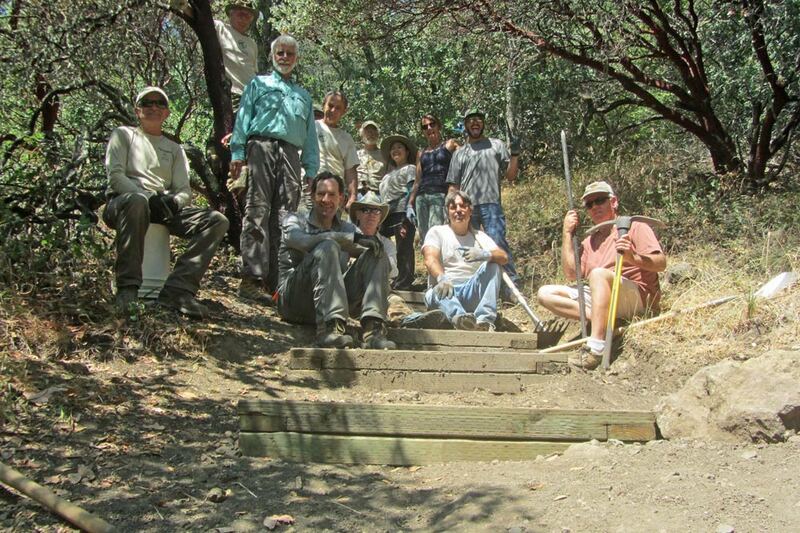 Sonoma County Trails Council volunteer trail work day at Sugarloaf Ridge State Park. From 9am to about 1pm. We will provide parking passes, tools and Clif bars with beverages and snacks afterwards. Bring gloves, a hat and water that you can take with you (hands free!) while working, and wear long pants, boots or hiking shoes and sunscreen. No experience necessary – we have tools and trained crew leaders with tasks for all strengths and sizes of volunteers. In order to make sure we have enough tools and after-work beverages reply to trailscouncil@sonic.net if you plan to attend. If you have any questions, don’t hesitate to contact us. 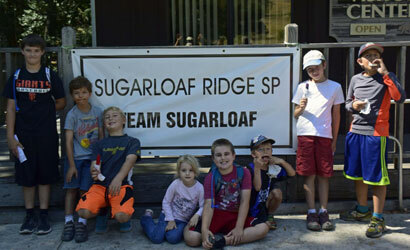 Your donations help keep Sugarloaf open for all! You can enjoy camping year-round at Sugarloaf with 47 family-friendly, alcohol-free camping spaces nestled in a large meadow and bordered by a year-round stream and a hillside forest. 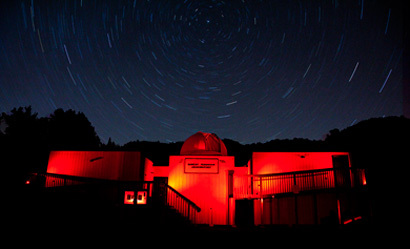 Completely dedicated to public viewing and education, the Robert Ferguson Observatory is the LARGEST in the western United States and it’s right here at Sugarloaf Ridge State Park. Sugarloaf offers a wide range of educational opportunities for classes of all ages! 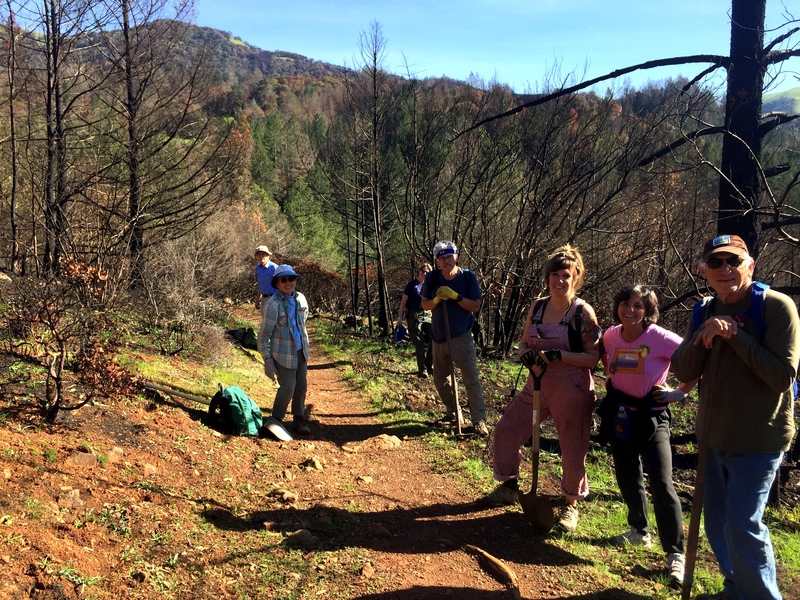 Featuring 25 miles of trails, year-round camping, a seasonal waterfall, one of the highest peaks in Sonoma County, and the headwaters to Sonoma Creek!